The plankton project continues, although there is talk about revisiting its purpose and methodology. The beach seining continues, with new questions being asked. As with any volunteer group, as people get educated and inspired, what was once new and strange is now part of daily life. Occasionally, people strike out on their own with personal projects related to natural history, and their level of commitment changes from year to year. Our group continues to evolve and grow. You can see a Citizen Science film of sand lance spawning here. Kwiaht now has a Flickr site with photos of people and species. Our Citizen Science group is open to all. Please see Julie or any other participant for information. Current projects include a Baseline Plankton Project (see Donna, Fred, Josie, Stan, or Bill C), a shorebird count (see Winnie or Tony), water quality (see Bob S or Glen), local herring population (see Glen), and beach seining (see Laurie or Gretchen). Kwiaht (see Russel Barsh) and we offer occasional free talks on natural history at the school or elsewhere. We have participated in seining our beaches for some time, first with Drs. Russel Barsh and Tina Wyllie-Echeverria, and more recently with the "Big Picture" group (Drs. Fresh and Beamer) and Kwiaht (Dr. Barsh). As far as I understand, the Big Picture group wants to get an overview of where juvenile salmon, especially chinook, go when they leave their natal streams or rivers. They count and measure, looking for migration pulses, fish sizes, and stream-of-origin data. Kwiaht wants to know what sustains salmon fry as they pause at our beaches on their way elsewhere, and what impacts their survival. What do they eat? What kind of beach do they congregate at? They count, measure, and do gastric lavage. They check water quality and the plankton and insects found in salmon fry stomachs. 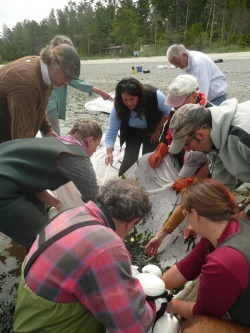 Our Citizen Science group wants to know what kind of fish, not just salmon, live here. We also want to help the scientists with whatever they're doing. We want to enable a knowledge-based sense of environmental stewardship in our community. This is a rough overview. If you are one of the people mentioned above and have a different sense of what's going on, please email me and I'll update the information. Also, please note that I do not give last names except with permission. If you are not an island resident, please be aware that this is a site intended primarily for islanders. We are not a tourist destination. Overview: Last year, integrating salmon with gut data didn’t integrate well, but this year, it might be clearer. We’ll look at insect data, too. This island took on the job of looking at non-salmon (greenlings, cod) gut contents. Lopez is looking at salmon. Students will look at beach insects. We expect to be done in 4 - 6 weeks. We and Lopez counted 11,000 prey items from 100’s of chinook this year. We will continue seining this year, even though the Big Picture project is over. We’ve completed two seasons of work, improving with experience and better technique. In 2008, we caught half the chinook that the whole program caught, this year 2/3. Our cost (nets, gear, microscopes) was $55,000. The cost of the federal and tribal agencies was $750,000 – so high that their study is not reproducible. For us, since we now have the equipment, our costs go down. Our Fishing Method:The federal and tribal teams asked us to work more independently, so we were freed up to create better methods. David suggested ways to get into deeper water, drifting the net parallel to the beach at 1 - 3 fathoms and then pulling it in like a big sail. Our catch per unit effort went up 500%! We validated the improvement when we fished with the tribal biologist in the morning and used our technique in the afternoon. We found significantly more fish, except late in the season. There was a larger size range from deeper water, both bigger and smaller fish. That suggests that the seine closer to shore was catching the edge of a larger aggregation of fish, not statistically representative of what was out in the main school. We got in between where the deep water tows and the beach seines were being done, and that’s where the fish were. In 2008 we found about 100 chinook total. We couldn’t do statistical analyses except in aggregate units of 3 months. This year, we caught between 35 and 65 salmon per day, so we could treat each day as a unit of analysis. Within a single day’s sample, they had different diets, which we couldn’t have concluded the previous year. That helps us drill deeper into the fish’s reality. The Federal Permit: Do we need a federal permit? Yes, because we are likely to catch endangered species such as chinook. Our total loss rate was .6%, compared with the tribal rate of around 5%. This is because of aeration and treating the fish gently. We watched the fish to be sure they were doing well before releasing them, and watched them when releasing them from their bucket to make sure they swam, and swam out. Where do we put our lavage effort? Ideally, we should focus on whatever we have a lot of for that particular day, whether it’s greenling, cod, or salmon. Glen: I think we should look at things that are not normally studied. For example, I watched a stream of tens of thousands of salmon go north past Pt. Hammond. Why? Under some conditions at Cowlitz, the salmon are thick, and under others, they’re not. We should be empowered to deploy the nets when these events happen. Fred: I’m interested in sand lance because of the study we participated in. How do they reproduce? Gretchen: We might target areas where we know particular prey items are available. We might do some exploring with hand nets. David: I’d like to learn how to do a rocky coastline set. That’s often where the fish are. 1. Fish Cowlitz every two weeks as a fixed reference point; we know we can find fish there. Ask residents of other bays to notify us about the presence of fish there and be prepared to mobilize as soon as they appear. We might be able to find out why they move as they do. 2. Lavage schedule: 100% of chinook and any large catches of other fish. We want to know if they are partitioning, or using different prey resources. Chinook/coho/chum/Pacific cod/greenlings. To lavage rockfish, we need to deal with their throat sphincters. 3. Predators: What’s eating salmon? Maybe this should wait until Monique Lance (seabirds) and Scott Pearson (seals) (http://wdfw.wa.gov/wlm/research/staff.htm) from Washington Department of Fish and Wildlife can visit in February. They want to collaborate, but it’s up to us. Glen: We should include Nathalie, too. Bill: What’s the value of our baseline plankton project? Can we improve our procedures to increase the value of our findings? Russel: Good science is curiosity driven. Last year we noticed that the plankton results didn’t dovetail with the lavage results. The payoff might be in: 1. How are climate changes affecting the timing of organisms? 2. How does that affect the trophic chain? We don’t have many long-term data sets for the ocean. Your study is long term and very powerful. Everything in the ocean is driven by the time of appearance of plankton. You may start seeing changes in the presence or absence of some of the animals. It might mean that their range has changed, or that they’ve lost out with respect to their neighbors. Thus, let’s re-think the project as related to climate change instead of salmon prey. It has the potential to be a very important study for our area. We’ll start to know after about five years. Fred: We started with the idea of doing a long-term study. FHL wants us to have a specific question. Russel: Do your techniques match your goal? Earth Observatories are data-dense studies that look at everything instead of having a narrow question. Fred: This summer we noticed that diatoms impede water flow through our nets. I’d like to keep doing the study but I want to know about water volume. We’d also like to add more data gathering such as salinity, temperature, acidity, and so on. Russel: Expense is a consideration. Scientifically, of course you should be doing this. You could also look at dissolved oxygen. Pollutants (there are 33,000 kinds in the Puget Sound). You balance time and error rate. Since you’re in it for the long run, change your techniques to give you the best long-term chance at information. You could do shorter tows or go to a wider mesh. I could contribute some funding for different nets. We have a water flow turbine that you can use, once you solve that shock wave problem. Russel: In the next year or two you should plan on getting a technical report out. Decide how to identify this project in conversation with scientists. Identify yourself as a unique research shop, possibly with a logo. People should hear from you directly. You should sit down and write out your methods. Bill, Stan: We want to have our samples checked. David: Richard Strathman of FHL wants to visit. He can help check your techniques. Madrona: One study shows that professional labs do have differences. Russel: You’re identifying plankton at the family level. As you jump down to the genus, the error rate goes up. At the species level, the error rate can be 50%. Fred: I want to drop the horizontal tows down to once a month, and vertical tows on the alternate times. The gut samples we saw included things we saw in vertical tows, and I’d want to capture that. Anne: If you’re not sampling hourly, you’re missing out. You can click on the grey links just above the oodling salmon picture. The 2009 beach seine notes are fairly complete. The 2007 and 2008 notes were not formal. You can also hover over most of the images to see them in larger format. Click on text that appears in light blue (sorry about the color) to link somewhere pertinent. Please talk to Julie if you have questions, additions, or corrections.